This page serves as a resource for all: those discerning their vocation and those living out their vocation. 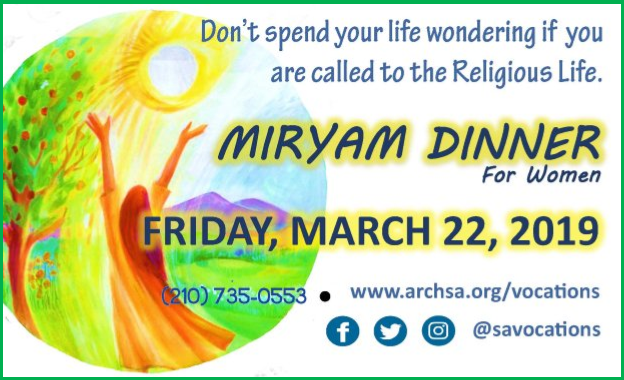 For more details and registration information on these and other Archdiocesan events of discernment, please visit: www.ArchSA.org/Voations. If you have any questions relative to vocations or would like to be a part of the Vocation Ministry, feel free to contact Dean and Joan Schoppe at dschoppe@2fastmail.com. God of wisdom and of counsel, You see in my heart a sincere desire to please You alone and to conform myself entirely to Your holy Will in the choice of my state in life. Grant me, I humbly implore You, by the intercession of the Blessed Virgin, my Mother and my holy Patrons, the grace to know what state in life I should choose and to embrace it when known, in order that thus I may seek Your glory and increase it, work out my own salvation, and deserve the heavenly reward which You have promised to those who do Your holy Will. Amen. O Father, you desire all of us to be happy. Stir up the grace of a religious vocation in the hearts of many men and women. Grant to them the willingness and generosity to give of themselves, their lives, their time and their talents to the service of Jesus Christ, Your Son, Our Lord and Savior, and to His Holy Church. May more men and women go forth as priests, deacons, brothers and sisters to bring the truths of our Catholic faith to all others so that soon they, too, may know You better and love You more… and serving You, be truly happy. Amen.